After the user is redirected to api.boxc.com they are prompted to sign in to their BoxC account and accept the requested permissions. The user is then redirected to the provided return_uri with a nonce hash appended as a parameter. The nonce must be captured by the application because it is required for retrieving an access token. With the application_id, application_secret, and nonce in hand the application may now call POST /oauth/access_token to retrieve an access token. The token lasts indefinitely, or at least until the user revokes the application's permissions. 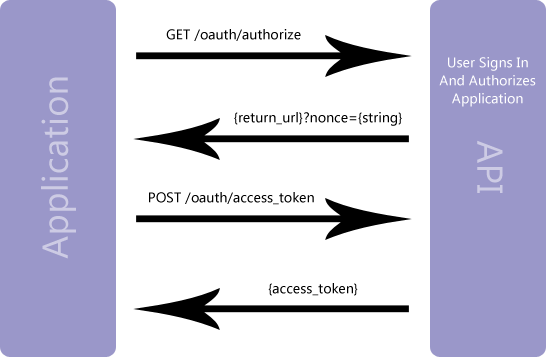 For all future requests to the API the application must place the user's access_token in the request header like the following example. String(64) - The access token. Set by the system. String - The application's unique identifier. String(36) - The application's secret key. String - A one-time authorization code returned by the system. It expires after 5 minutes. application_id The application's unique identifier. return_uri The application's callback URL that will process the authorization response.